This is a re-post of an article first published on DZone. Having worked with many Agile teams, I find that every team has a slightly different approach to prioritisation, and some teams are better at it than others. I’ve recently observed a sprint planning session where a team couldn’t agree on priorities, and it was an unpleasant place to be. My mission in writing this article is, therefore, to share some personal experiences with prioritisation, specifically some techniques and considerations during and outside of sprint planning. I hope that these suggestions can help you avoid the sticky situation of not knowing how to prioritise during sprint planning. Prioritisation is one of the most important aspects of any form of development work because choosing the right thing to do allows you to maximise the value delivered in a sprint. Having a shared understanding of priorities empowers a team to move in a uniform direction towards a common goal. There isn’t a “one-size-fits-all” approach to prioritisation but here are some general things you can do outside of sprint planning to help prioritisation decisions. If at all possible, you should avoid the prioritisation conundrum in a sprint planning meeting. 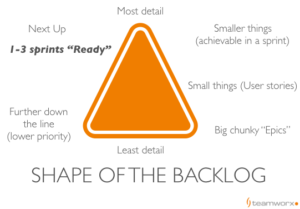 Remember, the Product Backlog is shaped like a triangle, with the most refined and high priority user stories on the top of the backlog, and the least important and least refined epics on the bottom. Continually prioritising and refining the product backlog, through the practice of frequent (usually mid-sprint) “Product Backlog Refinement” session, means that sprint planning is less of a prioritisation discussion than a “what’s the best way to do the work” session. Create a working agreement that defines what proportion of a team’s time should be spent on a particular type of work. For example: “Surprise and Delight” type work versus “Maintenance” versus “New Features”. In their book “A Coach’s Guide to Mastering Backlogs” Karen Greaves and Samatha Laing describe any type of work to be largely classified as one of four types. When it comes to prioritisation at sprint planning itself, here are some possible questions that can help guide your decisions. Which items are the most risky? Working this out is simple, and can be done in several ways such as having a verbal discussion, validating the user need through user testing, and surveying what current solutions lack through market research. You can simply have a discussion around those activities or use a framework such as “Importance versus Satisfaction”. Dan Olsen describes the framework in his book “The Lean Product Playbook” as a useful one for thinking about how to create customer value in a rigorous, analytical manner. Ensure that every piece of work has its business value articulated. One of the most common faults of development teams is not articulating the business value of technical debt (the “Past and Technical” work as referred to by Karen Greaves). As a delivery manager, I always encourage my teams to use simple one-liners. “Create a separate database” becomes “Create a separate database because the tight-coupling makes it time-consuming to make changes”. Factor in the effort for a piece of work into the discussion. Tackle the “low-hanging fruit”. 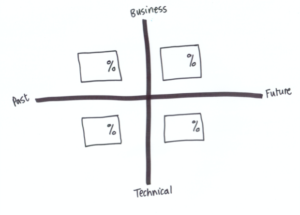 If two pieces of work are of comparable business value, pick the one with less effort. Look ahead and consider de-risking high-risk pieces of work by doing a “spike” (an investigation or proof-of-concept”). You may want to prioritise higher risk items to mitigate the risk early on in a project or sprint. Last but not least, remember that sprint planning should happen around a sprint goal. Every item in a sprint backlog contributes to the sprint goal, some more than others. 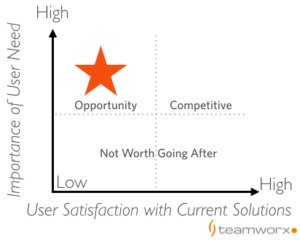 Consider prioritising the items that contribute most to the sprint goal.